Norma Lee Harris was born December 12, 1930 in Kansas City, Kansas. She went on to her heavenly home Tuesday, February 5, 2019 in Colorado Springs with her loving family by her side after a hard-fought battle with several illnesses. Norma was a resident of Colorado Springs since 1977. She is preceded in death by her loving husband, Ken in 1986; her father, Huber; mother and stepfather, Lova and Harold Baker; two brothers, Darrell and Jim; and her granddaughter, Shanna. 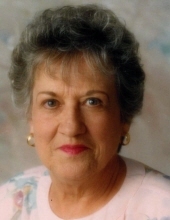 Norma is survived by two sons, William Keith (Celeste) Shaw and Terry Steve Young; daughter, Belinda Hairhoger (Sam); she also leaves behind grandchildren, Shawn, Corrine, Jennifer, Adam, Scott and Jeremy; numerous great-grandchildren and one great-great-grandchild; and many nephews and nieces. Norma was anxiously awaiting the arrival of another great-grand baby, Katja, due to arrive in July. Norma loved traveling, making dolls in her own kiln, eating out, working in her manicured yard, attending Red Hat lunches, being called NANA by her grand kids and especially spoiling the great-grand kids. She will be eternally missed by her family and wide circle of friends. Please join us in celebration of Norma's life, 10:00AM, Friday, February 15, 2019, The Springs Funeral Services, 3115 East Platte Avenue, Colorado Springs, Colorado 80909. To send flowers or a remembrance gift to the family of Norma Lee Harris, please visit our Tribute Store. "Email Address" would like to share the life celebration of Norma Lee Harris. Click on the "link" to go to share a favorite memory or leave a condolence message for the family.